Editor's Note: Edward Alden is a senior fellow at the Council on Foreign Relations. This entry of Renewing America was originally published here. The views expressed are the author’s own. Grover Norquist, the anti-tax crusader, is famously believed to have said that he has no wish to eliminate government, but only to “shrink it to the size where we can drown it in a bathtub.” Americans up and down the east coast can be grateful in the wake of Hurricane Sandy that he has not yet succeeded, or they might well have drowned in their own homes. - The Commerce Department’s National Oceanic and Atmospheric Administration, which is responsible for tracking the path of hurricanes and other storms, predicted days in advance – and with astonishing accuracy – both the path and strength of Hurricane Sandy. That gave governments throughout the region time to plan a response. - New York City Mayor Michael Bloomberg ordered the evacuation of nearly 400,000 people from low-lying areas of the city, and set up emergency shelters. That order probably saved countless lives given the heavy flooding in Lower Manhattan that came at the peak of the storm. - New York Governor Andrew Cuomo shut the city’s subway, rail, and commuter buses. The record storm surge led to severe flooding in seven subway stations, the worst in the system’s 100-year history. But no one was hurt in the empty stations. - New Jersey Governor Chris Christie ordered the evacuation of Atlantic City and shut the region’s casinos to keep people away from the dangerous coastline. - In neighborhoods everywhere, like my own in Maryland, county and city governments provided constant updates on road conditions, dangerous wires, downed trees, and other hazards, and advertised available shelters for those who lost power or had storm damage to their homes. - In the aftermath, the Obama administration quickly declared the hardest hit areas of New York and New Jersey to be disaster areas, freeing up millions of federal dollars for temporary housing and repairs to homes and businesses. This list could be much longer, but each represents a success born of planning and coordinated action to improve outcomes for large numbers of people – exactly what governments can and should be doing. 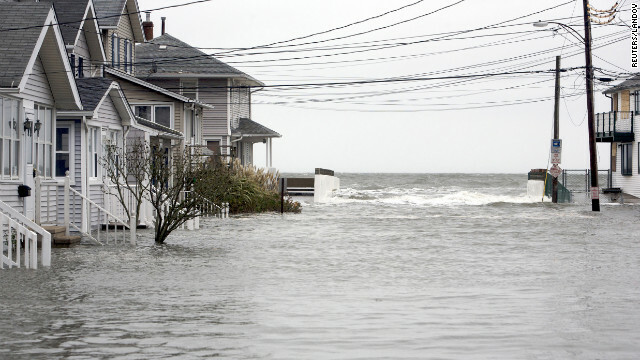 More from CNN: Is Sandy a taste of things to come? The contrast with the failed preparation and response to Hurricane Katrina in 2005 is striking. In the years prior to Hurricane Katrina, the Louisiana Army Corps of Engineers had identified some $18 billion in projects necessary to shore up the levees in New Orleans against hurricanes and flooding. Instead, Army Corps funding in the state was cut in half in the four years before the 2005 hurricane, with predictable consequences. Both federal and state governments failed to preposition supplies as the storm barreled in, there was little pressure on local residents to evacuate, and emergency responders took days to get to the scene after the storm to rescue the tens of thousands stranded in the city. There are some basic lessons in all this. First, we should invest in government services because we want them to be there when we are in a time of need. Whether it’s a natural disaster that affects millions or a company closure that leaves hundreds out of work, government has the resources to help people get back on their feet and start over. Second, governments – like businesses or individuals – can learn to do things better. The preparations for Hurricane Sandy would likely have been much poorer if not for the lessons from Katrina, from Irene, and from this past summer’s “derecho” storms in Washington. Third, the effort to pit state and local governments against the federal government is mistaken; when a genuine crisis hits, we need all three working effectively and in concert. As with all such disasters, human memory is short. Most of us will quickly forget Hurricane Sandy, move on with our lives, and grumble about high taxes. But if we keep letting them do their jobs – rather than continuing to cut them down — our governments will be busy preparing for the next time we really need them. « Previous entryWhat is Mine Kafon? Fareed has been right about investing in the infrastructure. Perhaps the aftermath of the storm would have been less devastating, had it been updated! It's time to do so, NOW! Tax increase under president romney is unimaginable for obvious reasons. No sane person would increase their own tax if they get power. Besides, he was involved in lobbying for specific tax cuts. He's not going to undo his own hard work. For gods sakes, he also took the help of tax shelter to decrease his tax burden. I don't think it's a possibility under president obama either because very senior senate leaders like durbin already said he doesn't want this either and president obama already extended it because he thought borrowing more to give tax cuts to everyone is great for U.S. So, U.S will probably continue to borrow to fund everything. Apart from irrecoverable human loss (may God bless them). The storm recovery would be a harder task, apart from the transportation systems and property damages; there were also many non tangible damages caused due to this superstorm. According to 'Reuters', Hurricane Sandy appears to have easily caused twice or even three times the losses of last year's Hurricane Irene. Whereas, Bloomberg reports that Hurricane Sandy threatens $20 Billion in Economic Damage. Besides significant property damage, Hurricane Sandy will cost billions of dollars in lost business, and partial or complete data loss from companies' physical datacenters. This made me thought that though it's an unfortunate lesson to have to learn the hard way, especially this hard way. But, natural disasters like hurricanes, floods or superstorms are dramatic examples of the value of cloud solutions when it comes to resiliency in the face of a catastrophe, and the ability to recover and resume operations as quickly as possible. It means that the Red States/republicans actually DO like the government when it hits their own pocketbooks. Duh. Why some people do not obeyed the President's warning messages? Who do we think we are? Non of us can beat the death, when the time is approached. Our parts are Flesh, Blood, Bones, and Soul. We could be affected easily, let alone the natural disasters. Mrs. Sandy said, "You can not stop the unstopable. No matter how much you tried, you can not blocked/interfered me. Your power is very limited. But, you can interfered and killed your fellow people. Just clean-up what I left for you behind. See you next time, weak-being." Did you ever do rafting? On my first time I fell in a grade 3 river (Dalaman River in Turkey) and passed several rapids before I was taken in. I had no scars or bruises. I learned to flow with the stream. Virtually. That was the best experiance of my life. The National Atmospheric Oceanic Administration, local and Federal level Governments, deserved a very good credit. They did whatever they can to help the people. What else we learnt from Sandy and Khatrine? Well, the answer is we must pass the MANDATORY LAW OF FORCEFUL EVACUATION. For those who refused to evacuate. Sandy turned out to be a worst case scenerio. To a degree that only fortunetellers and the wildest of tree-huggers can vission. Even at such a wild forecast USA goverment was able to calculate the risks (even when elections were so near) and take unprecedented measures. I say unprecedented because...well.. we all watch Holywood Disater Movies; and in all disaster movies the mayor, or the governor or a senetor preent the evacuation of a city 🙂 And this USA governing system did remarkably from the White House down to the individual sufferers. 1) Was this a global warming caused by carbon emission or a solar cycle that happens in every 13 000 years or so? 2) Did the well-cared -for USA citizens get a taste of what it means to be without water, light, heating and well best-liked-food. So that they can feel some emphaty for the rest of the world? 3) Did Mother Earth make herself noticed after all we have done to her? And made us relent and think twice? I always thought Bush will not run for a second time. When he won, I said to myself.."Well, he represents America than. Mr Bush is what most of American people are..." Here comes another election and I find myself wandering what the American people go after...They were pretty human when cooporating and helping each other against a disaster... Now can they do it or a long term or with other fellow humans of the world? Now that they do not need a black hatted cowboy compaired with Sandy. The republican supporters who bash government are just ignorant and gullible to rhetoric that is mostly hypocritical. Sandy is beginning to show a tremendous amount of similarity to Katrina. Zarkaria and the rest of the press who tore the President a new one over Katrina, where are you on Sandy? Hypocrites, you're too busy campaigning for your Marxist in Chief.